For the film directed by Shinobu Yaguchi, see Waterboys (film). For other uses, see Water boy (disambiguation). The Waterboys performing in Antwerp in 2003. L–R: Mike Scott, Geoff Dugmore, Steve Wickham and Brad Waissman. The Waterboys are a British-Irish folk rock band formed in Edinburgh in 1983 by Scottish musician Mike Scott. The band's membership, past and present, has been composed mainly of musicians from Scotland. Mike Scott has remained as the only constant member throughout the band's career. They have explored a number of different styles, but their music is mainly a mix of folk music with rock and roll. They dissolved in 1993 when Scott departed to pursue a solo career. They reformed in 2000, and continue to release albums and tour worldwide. Scott emphasises a continuity between The Waterboys and his solo work, saying that "To me there's no difference between Mike Scott and the Waterboys; they both mean the same thing. They mean myself and whoever are my current travelling musical companions." ^ a b c "A Rock in the Weary Land review". AllMusic. Retrieved 22 October 2005. ^ a b "The 'Big Music' of the Waterboys: Song, Revelry, and Celebration". Archived from the original on 24 October 2005. Retrieved 22 October 2005. This article appeared as part of the Academy of American Poets' web-based National Poetry Almanac's 2004 "Poetry and Music" series. The author is unidentified. See "Poetry and Music". National Poetry Almanac. Archived from the original on 17 November 2005. Retrieved 1 December 2005. for more information about the series. ^ McGee, Alan (27 March 2008). "Time to rediscover the Waterboys". theguardian.com. Retrieved 21 December 2014. ^ "6 Echoes of The Big Music". Retrieved 22 October 2005. ^ a b c d e f g "FAQ". mikescottwaterboys. Archived from the original on 11 April 2008. Retrieved 28 October 2005. ^ a b c Peter Anderson. "Mike Scott/Waterboys biography". Record Collector. Archived from the original on 3 May 2005. Retrieved 22 October 2005. ^ a b c d "Archive 1978–85". mikescottwaterboys.com. Archived from the original on 27 September 2007. Retrieved 28 October 2005. ^ Scott, Mike (2002). "Recording Notes". The Waterboys. EMI. p. 2. ^ A comparison which continues to be made. See "Allmusic review". Retrieved 22 October 2005. ^ a b Gerry Galipault. "Mike Scott is The Waterboys and The Waterboys Are Mike Scott". Pause and Play. Archived from the original on 19 March 2006. Retrieved 22 October 2005. ^ "Mike Talks". mikescottwaterboys. Archived from the original on 23 May 2006. Retrieved 1 December 2005. ^ a b "Abbey Events". Abbey Theatre Home. Archived from the original on 5 December 2010. Retrieved 11 April 2010. ^ "The Waterboys Present: An Appointment with Mr Yeats". The Irish Times. 3 March 2010. Retrieved 11 April 2010. ^ "Fear Not: Heaven is Just Around the Corner". Michael Harding The Irish Times. 3 March 2010. Retrieved 11 April 2010. ^ "Joe Chester on Soundcloud". soundcloud.com. Retrieved 18 November 2010. ^ a b "Waterboys news updates". mikescottwaterboys. Archived from the original on 30 March 2010. Retrieved 11 April 2010. ^ Weaver, Matthew; Nasaw, Daniel (17 June 2009). "Guardian Sea of Green". The Guardian. London. Retrieved 11 April 2010. ^ "Waterboys news yeats". mikescottwaterboys. Archived from the original on 30 March 2010. Retrieved 11 April 2010. ^ "Grand Canal, Waterboys, November 7, 2010". Grand Canal Web. Retrieved 11 April 2010. ^ "The Waterboys: An Appointment With Mr Yeats – Review". BBC Music. 6 September 2011. Retrieved 8 October 2011. ^ "The Waterboys share first track from new album, Modern Blues". Uncut. Retrieved 15 December 2014. ^ "The Waterboys announce new album, Out Of All This Blue". Uncut. Retrieved 19 March 2019. ^ "The Waterboys, New Single 'If The Answer Is Yeah' Out Now". Front View Magazine. Retrieved 19 March 2019. ^ "The Waterboys Announce New Album 'Where The Action Is'". Broadway World. Retrieved 19 March 2019. ^ "Findhorn". mikescottwaterboys. Archived from the original on 8 August 2004. Retrieved 18 November 2005. ^ "Too Close to Heaven history". mikescottwaterboys. Archived from the original on 23 May 2006. Retrieved 18 November 2005. ^ "Allmusic biography". Retrieved 3 November 2005. ^ "Room to Roam review". Rolling Stone. Archived from the original on 1 November 2007. Retrieved 3 November 2005. ^ "Mike Scott". Chicago Other Voices Poetry. Archived from the original on 30 June 2006. Retrieved 2 November 2005. ^ "One World peace concert". EdinburghGuide.com. Archived from the original on 22 May 2006. Retrieved 16 January 2007. ^ Thomson, Graeme (11 March 2010). "Why Poetry and pop are not Such Strange Bedfellows". The Guardian. London. Retrieved 11 April 2010. ^ The phrase "Bury My Heart at Wounded Knee" is originally from Stephen Vincent Benet's poem "American Names". ^ "Waterboys Express Spirituality". Chicago Innerview. Archived from the original on 11 February 2006. Retrieved 29 October 2005. ^ "The Waterboys concert review". Pop Matters. Retrieved 29 October 2005. ^ "Roddy Lorimer". Kick Horns Line Up. Archived from the original on 24 October 2005. Retrieved 31 October 2005. ^ Wickham agrees. "An interview with Steve Wickham". Archived from the original on 15 February 2005. Retrieved 22 October 2005. ^ "Karma to Burn reports". mikescottwaterboys. Archived from the original on 12 October 2007. Retrieved 3 November 2005. ^ "Universal Hall, Findhorn, Scotland, January 2002". Cluas.com Irish music. Retrieved 30 October 2005. ^ "Sharon Shannon biography 2005" (PDF). The Daisy Label. Archived from the original (PDF) on 24 May 2006. Retrieved 30 October 2005. ^ "Bassist Mark Smith Dies". Music Week Web. Retrieved 11 April 2010. ^ "The Waterboys: The 13th Floor Interview Archived 15 February 2015 at the Wayback Machine. 13th Floor. Retrieved 15 February 2015. ^ De Lisle, Tim (8 February 2015) "Event: The Waterboys, Roundhouse, London. Mail on Sunday. London. The article states: "It's a fact. 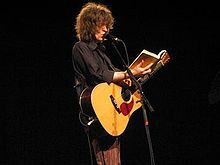 Mike Scott's band must hold the record for the most members over the years: whereas the Fall have had 66, there have been more than 70 Waterboys!" Wikimedia Commons has media related to The Waterboys.